Peter Hirst of Render East and Ben Cooper of PPH Commercial at The Bloc. A fast-growing construction company which has helped to transform 3,000 houses in its hometown of Hull is planning further expansion after moving its operation across the city. Render East sees the relocation to The Bloc in Anlaby as a key step towards its next aim of doubling turnover. The growth will also benefit a partner company, Ilke Homes, which specialises in producing precision-engineered modular homes from its new factory near Knaresborough. 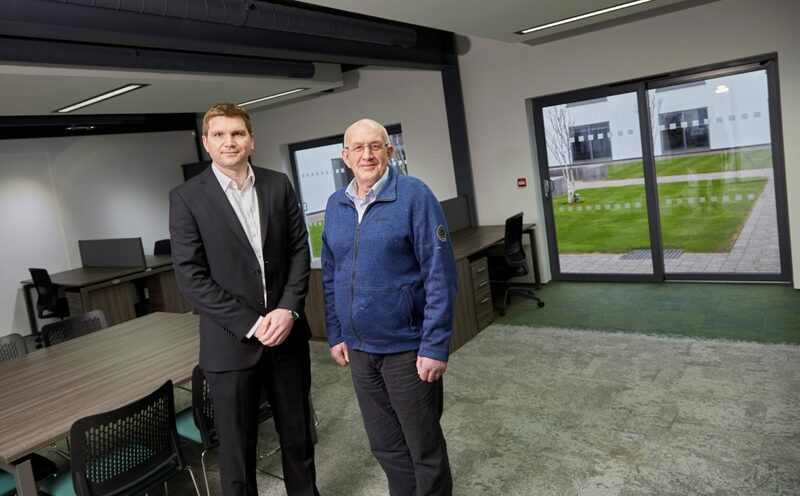 Render East was launched in 2014 by its director, Jim Morgan, who left a prominent Hull-based construction company because he wanted to pursue his own ideas and ambitions. The company now has a workforce of more than 130 with a mix of direct employees and sub-contractors, and the management team of three is pursuing a strategy of increasing the company’s activities in external wall insulation and render coatings and developing new products and services. “As the preferred contractor we hope to secure similar work in the near future and we’re also busy with Ilke Homes, which works all over the country and has current projects in Hull, Mansfield and Somerset. The Bloc, part of Allenby Commercial’s portfolio of properties, opened five years ago and its Grade A office space has attracted businesses operating in sectors including recruitment, marketing and design, accounting, IT, care homes and logistics. James Joannou, Associate Director of Allenby Commercial, said: “The opportunity for Render East to move into The Bloc arose because of the departure of another business which had outgrown the space having expanded from five people to 40. Ben Cooper, Divisional Director of PPH Commercial, added: “As home to about 25 businesses which between them employ around 250 people The Bloc is very significant to the Hull and East Yorkshire economy. Be the first to comment on "Render East heads west to build its business at The Bloc"